Magical Stones are found scattered across the landscape in Cyrodiil. If you are looking for information on smaller magical stones, see the pages on Sigil Stones, Varla Stones, and Welkynd Stones. There are two types of ancient magical stones in Cyrodiil: Rune Stones (Runestones) and Doom Stones (Doomstones). 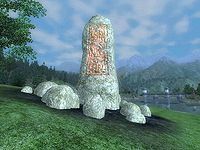 Both appear as a rune-covered monolith in the center of a circle of stones. Rune stones have glowing green runes, and provide a bound weapon and bound piece of armor when used. Doom stones have glowing red runes and provide greater powers, similar to those of many birthsigns, that can be used once a day. Doom stones only work at night (6pm to 6am). The Arcane University hosts a series of lectures on these magical stones, which can provide the player with additional background information on the nature of the stones. However, the lectures do not necessarily provide accurate information. Birthsign Stones grant one of several Greater Powers specific to that stone. These powers can only be obtained one at a time. For example, if you acquire Arcane Well from the Atronach Stone and then use the Lady Stone, your Arcane Well power will be replaced by Lady's Warding; you cannot have both. However, you may switch between Birthsign Stone powers as often as you wish, and using a Birthsign Stone will not replace the birthsign and birthsign power chosen as the beginning of the game (e.g., if you chose The Shadow at the start of the game and then use the Atronach Birthsign Stone, your character page will still list The Shadow and you will retain the Moonshadow birth power in addition to Arcane Well). Heaven Stones, like their Birthsign counterparts, grant one Greater Power each. Unlike Birthsign Stones, the powers do not replace each other when a new stone is used; one may obtain and keep all seven Heaven Stone powers by visiting each of the seven stones. Due to their greater power, Heaven Stones also have a Renown requirement, which differs by stone; the sum (not difference, as some sources state) of your Fame and Infamy must exceed the required number, or the Stone will, when used, display a message stating that "The Hero's fate is known when the Hero's fame has grown." The renown requirement can be met by wearing the Gray Cowl of Nocturnal reward from the Thieves Guild, as it gives you 100 Infamy whenever worn. Both types of Doomstone can only be used at night, between 6pm and 6am. Attempting to use them outside these hours will result in a message saying "No stars shine upon the doomstone." The powers acquired from Doom Stones also add the relevant spell effects to the list of effects your character knows, and therefore can be used when creating custom spells or custom enchanted items. In particular, Doom Stones provide one of the few ways to acquire the Fortify Skill and Resist Frost effects; they can also make Chameleon available to characters with low Illusion skill. Just southwest of Skingrad (Map) Void Seed (0006A8EE) Fortify Illusion and Fortify Alchemy 20 pts for 120 seconds. Northeast of Kvatch. Midway between Shardrock Farm and the Ayleid ruin Talwinque. (Map) Arcane Well (0006A8EF) Spell Absorption 30 pts and Fortify Intelligence 10 pts on Self for 120 seconds. West of Anvil. (Map) Lady's Warding (0006A8F2) Fortify Willpower and Fortify Endurance 20 pts on Self for 120 seconds. North of Anvil, northwest of Last Chance Camp. In the mountains. (Map) Ysmir's Scales (0006A8F3) Resist Frost 50%, Fortify Heavy Armor 10 pts, Fortify Light Armor 10 pts on Self for 120 seconds. East of Bravil, far south-southwest of Cheydinhal. South bank of the Silverfish River, about where the R is in Silverfish. (Map) Lover's Bower (0006A8F5) Fortify Personality and Fortify Luck 20 pts for 120 seconds. Southeast of Cheydinhal. Far northeast of Bravil. North of Silverfish River. (Map) Magicka Manifold (0006A8ED) Fortify Magicka 50 pts for 120 seconds. Southeast of Bravil. North of Leyawiin, on the eastern bank of the Lower Niben. Opposite side of the road from Nocturnal's Shrine, slightly north. (Map) Mara's Milk (0006A8EB) Restore Health 100 points on Self. Mara's Mercy (0006A8EC) Restore Health 150 points on Target. Southeast of Leyawiin. West and slightly north of Bogwater. Directly north of the "Y" in Topal Bay. (Map) Cobra's Dance (0006A8F8) Paralyze 5 seconds and Damage Health 4 pts for 20 seconds on target. Southeast of Imperial City, south of Cheydinhal. East-southeast of the Yellow Road's bridge over the Corbolo River. (Map) Fingernail Moon (0006A8F6) Chameleon 15% for 120 seconds. Visible to the south of the Blue Road leading from Fort Urasek (on the east shore of Lake Rumare) to Cheydinhal. North of the Ayleid ruin of Nagastani. (Map) Hellride (0006A8F1) Fortify Speed and Fortify Acrobatics 20 pts on Self for 120 seconds. Along the road leading from the Imperial City to Bruma, a little in the woods on the east side. (Map) Cheater's Nip (0006A8F4) Fortify Agility and Fortify Luck 20 pts on Self for 120 seconds. South of Imperial City Waterfront district, southwest of the Arcane University. North end of the island between the two branches of the White Rose River. (Map) The Master's Hand (00008E53) Fortify Armorer 20 pts on Self for 120 seconds. Warden Key (0006A8F7) Open Hard Lock in 15 ft on Target. Southeast of Skingrad. Slightly northwest of the Ayleid ruin of Silorn. (Map) War Cry (0006A8F0) Fortify Strength 20 pts; Blade, Blunt, and Hand to Hand 10 pts on Self for 120 seconds. In the forest between Chorrol and Skingrad. South of Weatherleah, directly north of Bleak Flats Cave, east of the Shrine of Sanguine. (Map) 10 Jone's Shadow (0006B69E) Invisibility, Fortify Sneak 30 pts, Fortify Acrobatics 30 pts, Fortify Athletics 30 pts for 120 seconds on Self. Northwest of Skingrad. Slightly south of Bleak Flats Cave. (Map) 20 Gates of Aetherius (0006B69D) Fortify Magicka 50 pts, Resist Magic 20% on Self for 120 seconds. East of Anvil. Southeast of Troll Candle Camp. (Map) 30 Jode's Blood (0006B69F) Fortify Health 40 pts, Fortify Blade 20 pts, Fortify Blunt 20 pts, Fortify Hand to Hand 20 pts for 120 seconds. North of Kvatch, in the center of the triangle formed by Fort Linchal, Mongrel's Tooth Cave and Shattered Mine. (Map) 40 Sithian Web (0006B6A0) Fortify Illusion 20 pts, Fortify Marksman 20 pts, Fortify Mercantile 20 pts, Fortify Security 20 pts, Fortify Speechcraft 20 pts for 120 seconds. Southeast of Bravil, Northeast of Leyawiin. East of Haunted Mine and Atatar in the Nibenay Valley, East-northeast of The Drunken Dragon Inn. (Map) 50 Skein of Magnus (0006B6A1) Fortify Alteration 15 pts, Fortify Alchemy 15 pts, Fortify Conjuration 15 pts, Fortify Destruction 15 pts, Fortify Illusion 15 pts, Fortify Mysticism 15 pts, Fortify Restoration 15 pts, for 120 seconds. Northwest of Leyawiin, just north of Telepe. (Map) 60 Shield of Shezarr (0006B6A2) Reflect Spell 10%, Fortify Block 20 pts, Fortify Heavy Armor 20 pts, Fortify Light Armor 20 pts, Fortify Armorer 20 pts for 120 seconds. North of Cheydinhal. Northeastern tip of Lake Arrius. (Map) 70 Dragon Dream (0006B6A3) Fortify Magicka 50 pts, Fortify Health 40 pts, Fortify Fatigue 100 pts on Self for 120 seconds. This stone does not exist in game, but its greater power can be found in the construction set. 100 Nirn's Breath (0006B6B1) Detect Life 100 ft, Fortify Fatigue 200 pts, Fortify Health 100 pts on Self for 120 seconds. All the rune stones bind a weightless armor and weapon, which will disappear after the spell wears off. If the rune stone can bind either a Blade or Blunt weapon, you will receive whichever weapon type in which your skill is greater (a tie goes to the Blunt weapon). There are three different kinds of rune stones: Reman, Sidri-Ashak, and Hestra. Each binds weapons and armor specific to its kind. Multiple instances of each are scattered throughout Cyrodiil. Activating a rune stone counts as casting a conjuration spell, and therefore trains your Conjuration skill as well. If you try to use the same type of rune stone twice in the same day, you will receive a message "Stones sleep. Stones rest this day." You will not be able to receive any armor or weapons. You will also receive this message if you try to use the rune stone on the same day of the week as your previous use (e.g., if you last used a Reman Rune Stone on a Tirdas, you will not be able to use any Reman Rune Stones on a Tirdas). Wait until after midnight and you will again be able to use the stone. 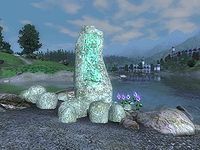 Whereas patches of multiple common plant types or a single uncommon or rare plant type are found all over Cyrodiil, Rune Stones are always surrounded by a patch of four or five uncommon or even rare plant types. Rune Stone patches are a specifically good way to see plants and obtain their alchemy ingredients that players may have only seen in merchant inventories, all at one location. Rune Cuirass and Sword or Rune Cuirass and Axe: Summons a Bound Cuirass (Heavy Armor), and a Bound Sword (claymore) or a Bound Axe, for five minutes. The stone will determine which to use based on the higher of your Blunt and Blade skills. There are nine Reman Rune Stones in all (see the oblivion map). Rune Bow and Helm: Summons a Bound Bow and Bound Helmet (Light Armor) for two minutes. There are five Sidri-Ashak Rune Stones in all (see the oblivion map). Rune Blade and Bracer or Rune Mace and Bracer: Summons Bound Gauntlets (Light Armor) and a Bound Dagger or Bound Mace, for five minutes. There are ten Hestra Rune Stones in all (see the oblivion map). Esta página foi modificada pela última vez à(s) 14h54min de 24 de outubro de 2015.